​Transitioning back into standard time when we turn back our clocks in the fall may be easier than losing an hour of sleep in the spring, but it can still mess with our body's natural sleep cycle. So, as we allow our bodies to adjust, it's important to make sure we get plenty of sleep — especially before we get behind the wheel. Drowsy driving was responsible for 846 deaths in 2014, according to the National Highway Traffic Safety Administration. Going 21 hours without sleep mimics having a blood alcohol concentration of 0.08 percent (the legal limit in Pennsylvania). Fatigue-related fatal and injury crashes cost society around $109 billion per year — and that's not including property damage. Sleep is the only remedy for drowsy driving. If you are behind the wheel and feeling tired, take a break! Rolling down the window, turning up the radio or AC, or drinking a caffeinated beverage is not enough to stave off drowsiness. If you're planning a long trip, don't drive alone. Vehicles in which the driver is accompanied by a passenger are nearly 50 percent less likely to be involved in a drowsy-driving-related crash. If you must drive alone, schedule breaks every two hours or 100 miles to stretch and move around. And if you think you are too tired to drive, fine a safe, legal place off the roadway to take a nap. 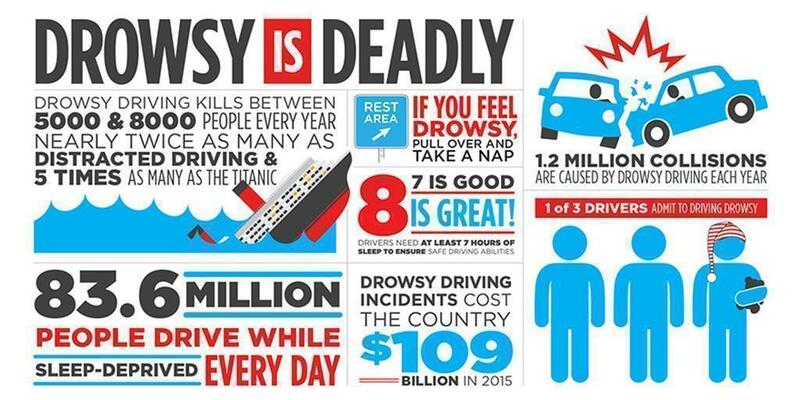 Drowsy Driving Prevention Week is Nov. 5-12; learn more at the National Sleep Foundation’s website.